Happy easter everyone! Hope your holiday went well. 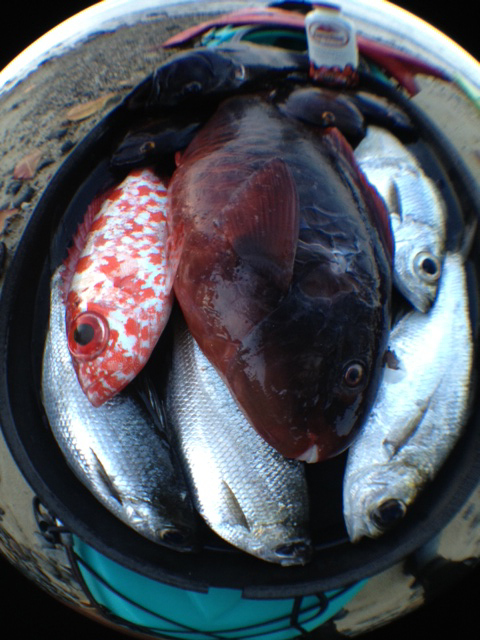 Got a call this am from Go-Naminori to get dinner so by 10 am we were ready to go! We head out to check the blue water but since we were low chum we were not successful but did get to see a huge humback whale swim right under us. We head in and see some of our surfing friends diving. 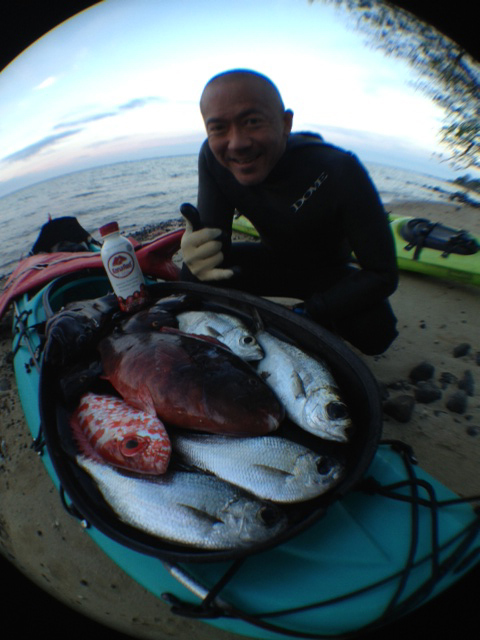 Here Kylen Yamakawa had a full stringer of red menpahi. I think there were eight of them diving together. 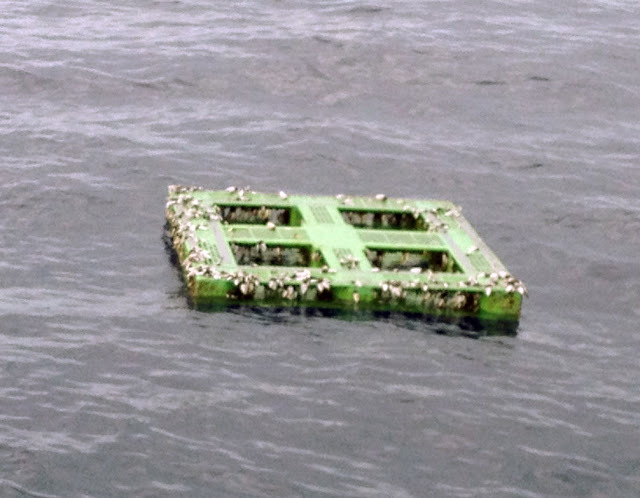 All their floats are 10 ft apart and they dive safe together. 14 year Seth Moniz was also in the line up diving and this kid is the next generation of professional surfing. Kirby is their uncle and has been teaching them to dive so now they are hooked! So we had to get in and get some too. Kirby got some nice red ones. 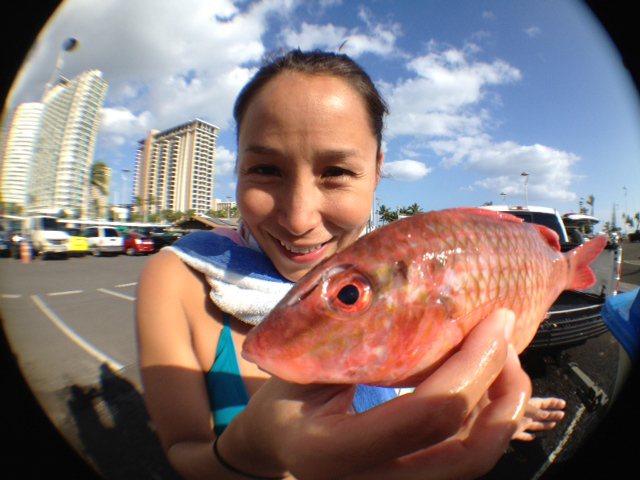 Maki speared her 2nd kumu. Kekoa got the largest Lai ever. And the cooler was full and ready to go home and cook our easter dinner. Thanks Kirby for a great day of diving! Catching Mahi is fun! This one James and I landed was green and did not want to come in the boat. 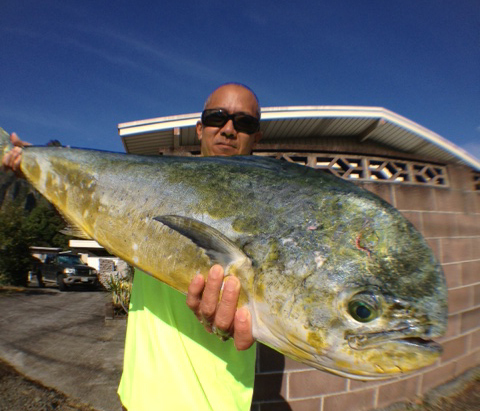 If there are lots of mahi in the water its always good to leave one in the water to keep the school around. Once you remove the male from the water, the other females tend to swim away. 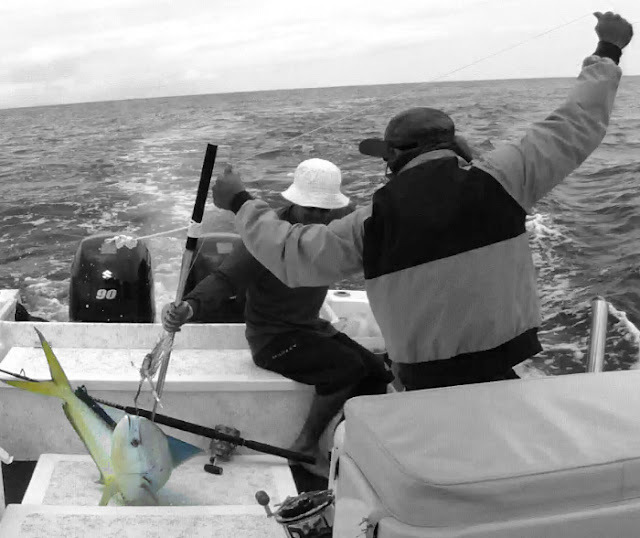 Once we got it in the fish jumped all over and we had to be careful with the trailer hook. 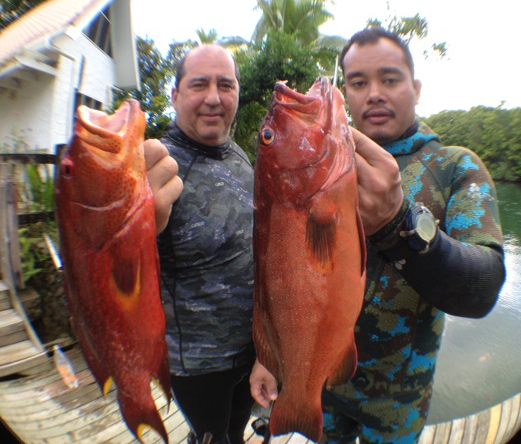 Its fun learning new methods of catching fish and fishing does require lots of patience, persistence and a deeper pocket for all the fuel. This weekend was very special for these two young boys. 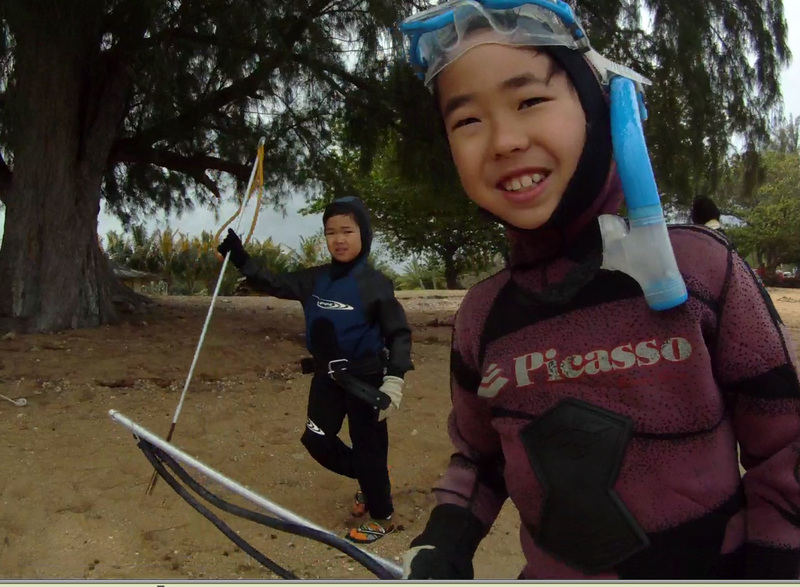 It was their first spearfishing experience in the waters of Kauai. Maika (left) is 7 years old and Kai (right) is 8 and they were about to embark on a journey that would change their lives forever. Lots of children like to watch tv, ride bike, play video games, but when you can go outside and enjoy natures finest moments you will never be the same. Walking to the the beach, you could see the anticipation on their faces. 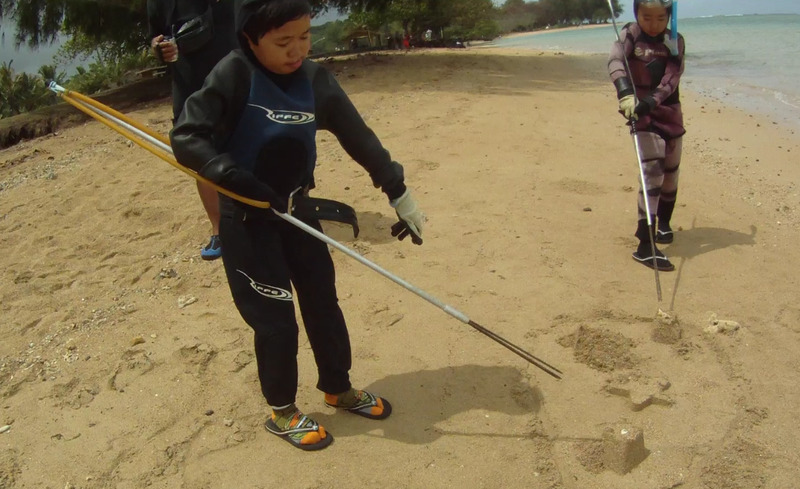 Winds were up, little rain, cold but both were ready and nervous but kept walking, practicing with their 3 prongs poking leaves, sand, and rubbish on the ground. 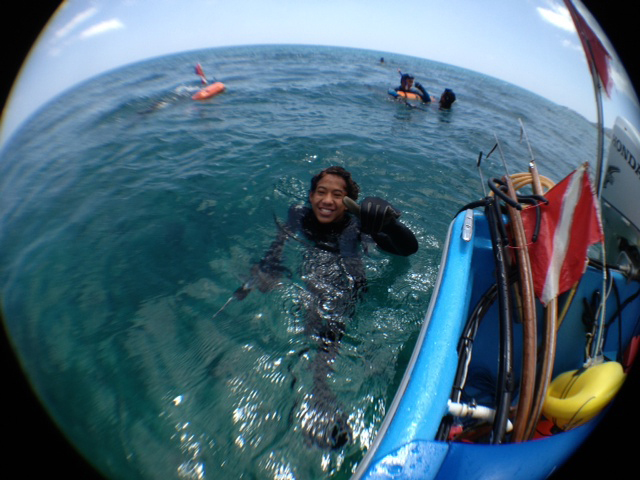 We talked about dive plan, weather conditions, currents, and safety. It was a great day and we got to see some cool things in the ocean. Once Maika spotted some fish he got excited and started pulling back his rubber on the 3 prong. Swoosh, bam, almost he got one..Hope you boys had lots of fun! At Kilauea lighthouse on Kauai. Glad I'm on shore today. Today was another picture perfect day in paradise! Small waves and kona winds blowing made it hard to work in the office so had to visit the jobsite. 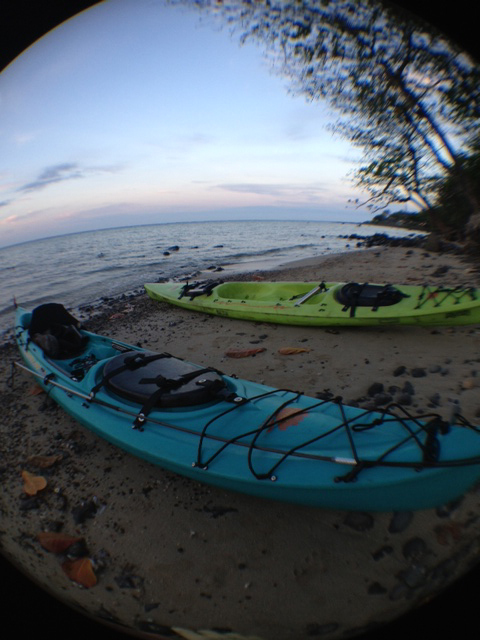 Travis called me up and wanted to go for a dive so I finished up my paper work and we headed out for a late afternoon kayak dive. 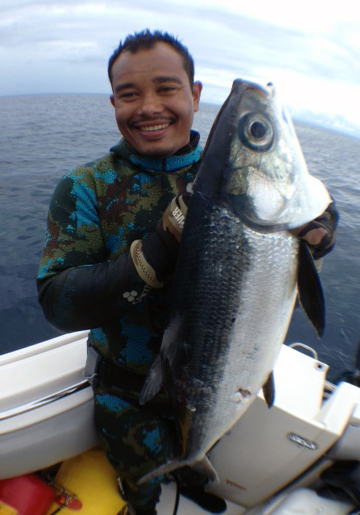 We worked the outside for some uhus then decided to come in for some small fry fish. We had one 3 prong so we were taking turns dropping. Just enough for dinner. The red one is called an aweoweo and is really good fried. 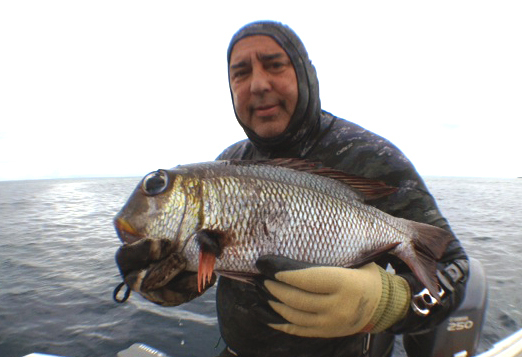 The silver fish is called Aholehole and is also delicious. Kole is one of my favorites and a uhu for the steamer. Wow gotta love this weather! Look how flat it is on the eastside! Probably one of the best conditions I've seen in a very long time. 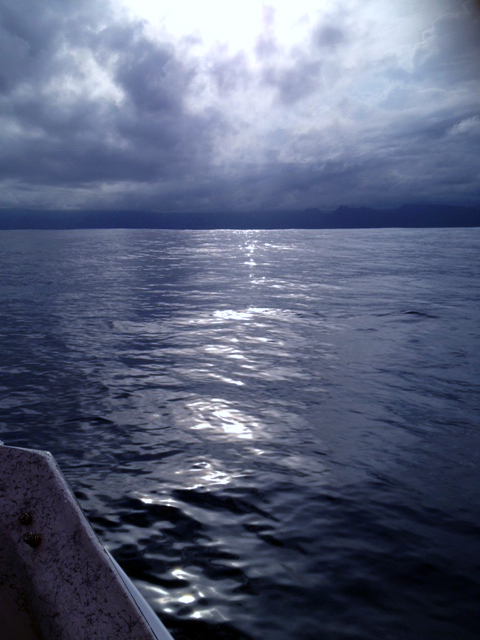 Boarded the Red Sea boat in search of aku for my family as thats the fish most wanted for this weeks menu. Of course my arsenal is comprised of Gaji lures thanks to my dear friend Allan Sato. 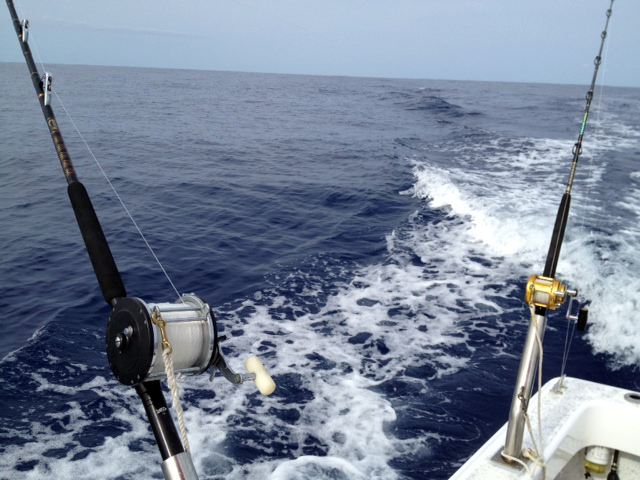 Still in need of some good reels though cause this may be the year we catch our first ahi. Sponsors? Was quiet for a while then like a sign from Heaven, James spots a rubbish with one bird sitting on top..I pull up and its tsunami debri from Japan. WOW! This is a fisherman's dream come true! Couple passes on this plastic crate full of barnicles and Bam! Port 12/0 goes off screaming! Quick I turn on my go pro and document the action. I put on my bungie auto pilot while I clear the lines and James reels it in. 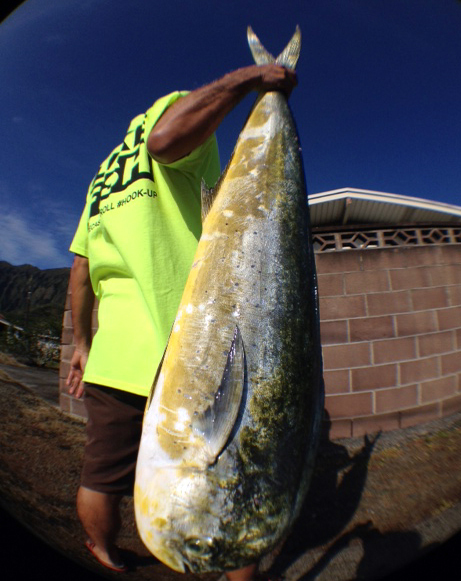 It was a nice size female mahi full of eggs. Had to get the back shot with my lucky T! After 2 more strikes we lose a couple aku but was able to land one. 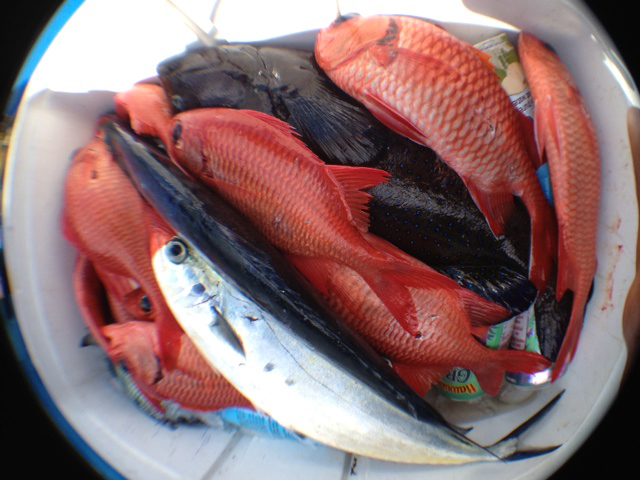 Great day on the water whenever you catch fish! Final set up of our booth before the doors opened at 9 am. 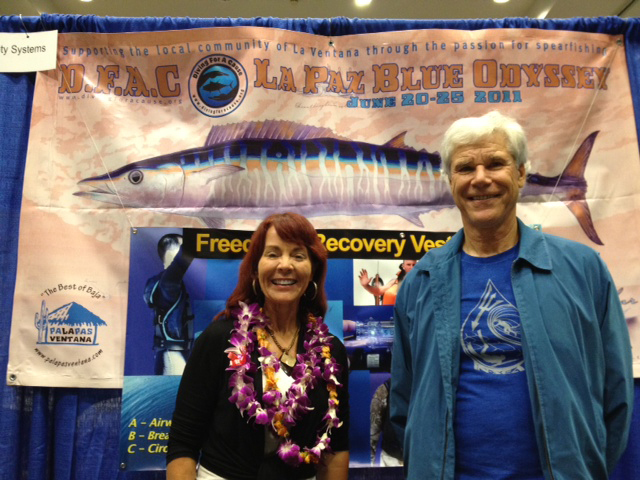 at the Hawaii Fish and Dive Expo. The weather was pouring rain so it kept everyone indoors today. 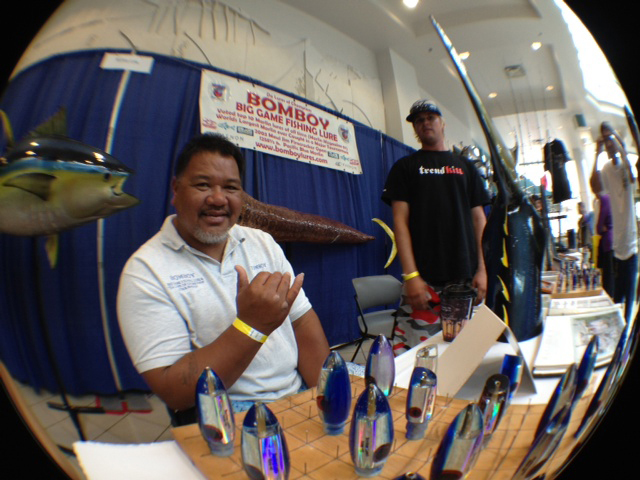 I did a quick walk to visit other booths and saw Bomboy Llanes and his incredible fish mounts and lures on display. 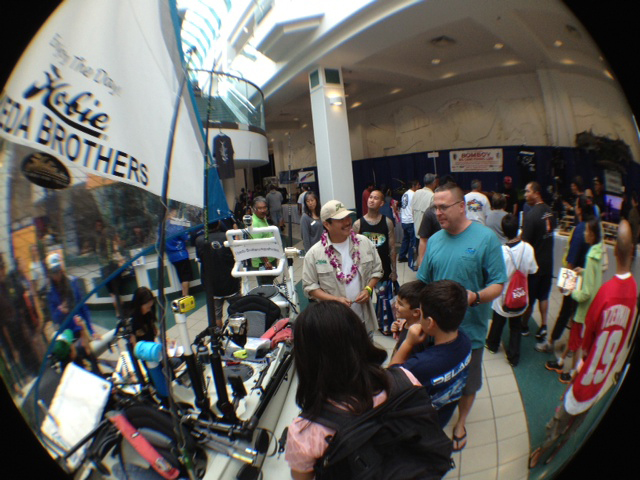 Kayak fisherman were in the house showing how to rig up their yaks. Clifford Cheng aka "Voice" is always the man behind the scenes running from the Red Sea Paparazzi. You can run but you cannot hide from the Red Sea Cam. Ha Ha! 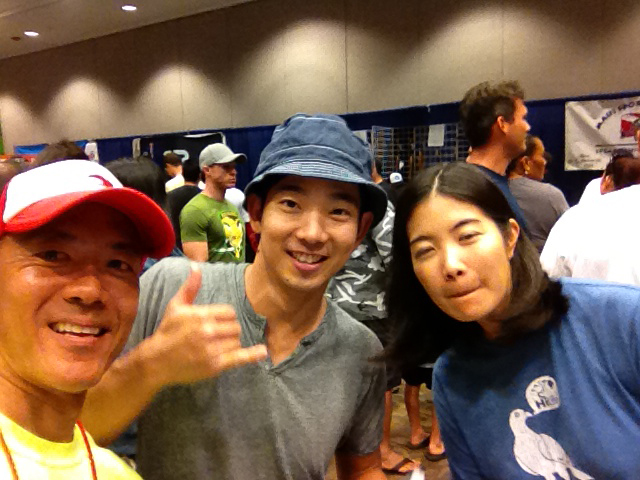 Even Jake Shimabukuro and his wife Kelly came by to say hi. Jake will be on a future HSD show some day...Thanks for stopping by! Of course, Merlinda drew the crowd forming lines outside the booth while signing autographs. Colleen Gallagher and Terry Maas from DFAC also were next to us and promoting their organization and life vest. 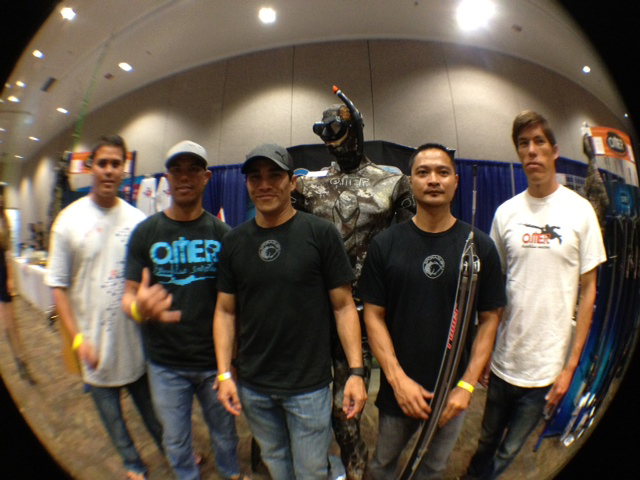 Team Omer was well represented by Kapono, Jon, Mike, Marnie, and Kurt. 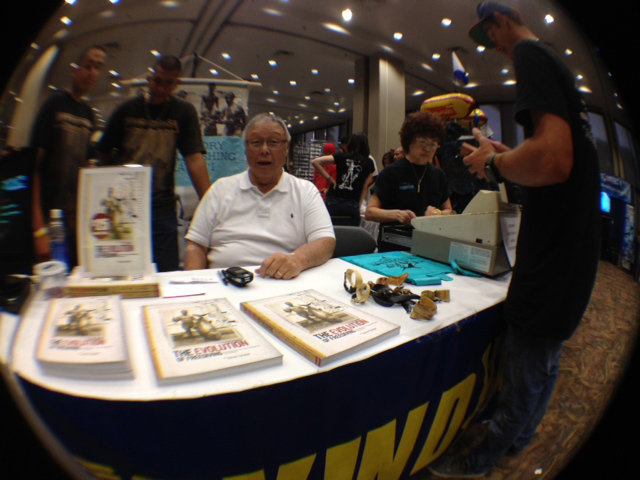 Legendary Sonny Tanabe was giving autographs. 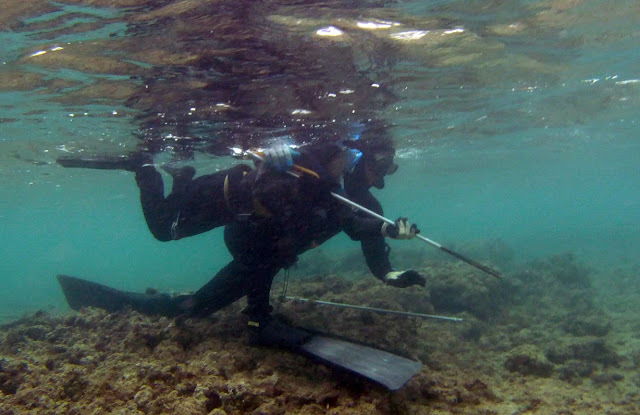 His book "The Evolution of Freediving" was going fast. 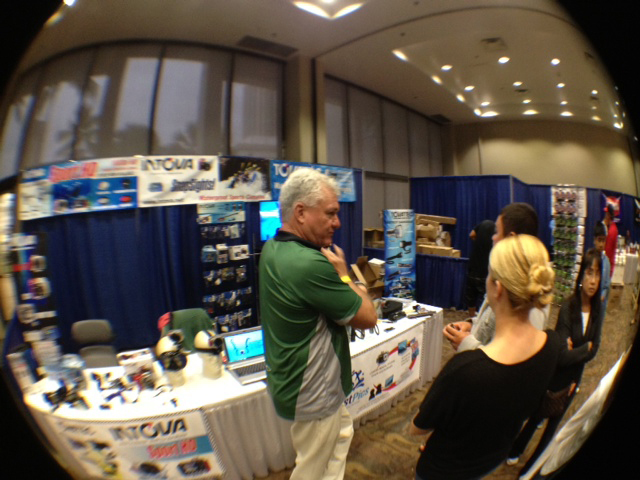 Joe from Intova cameras was sharing their new products to interested shoppers. 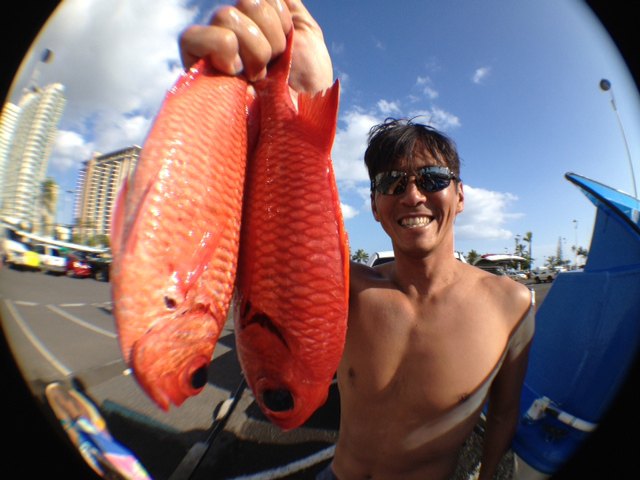 Kurt Taguma from Maui Sporting Goods also made lots of sales. James Oshiro signing his life away. MSG had the most staff on hand and did well. 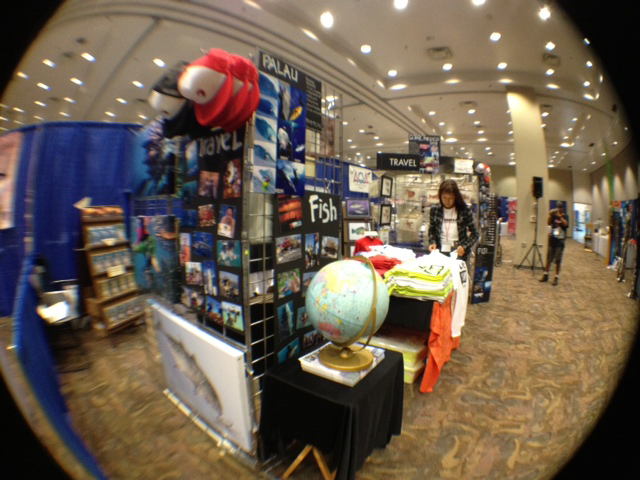 Another view of our booth before the crowd. 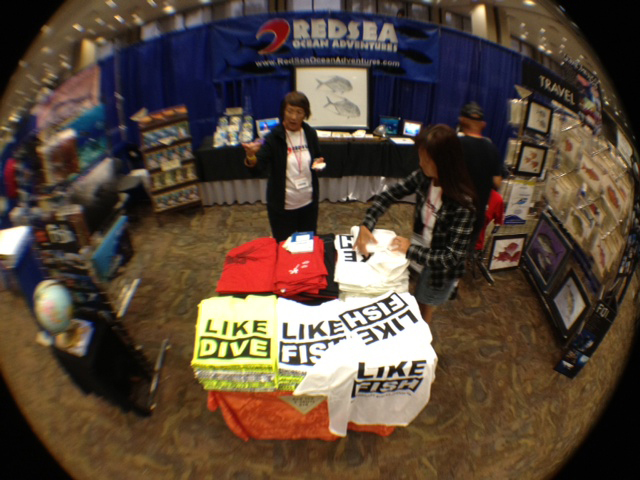 Red Sea "FB" Like shirts flew of the table. One guy even wore it to go. Ben Wong from LGF came by to say hello too. 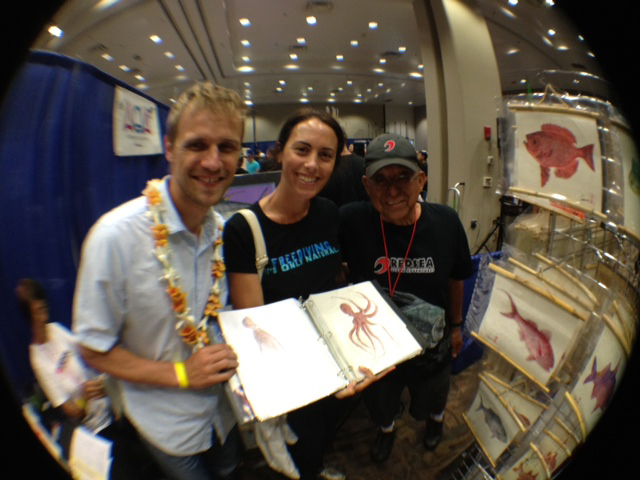 Martin and Nikki from FII also dropped by and admired the gyotaku work of Crow. Martin and Garrett McNamara were speakers today at the event talking about big wave surfing. 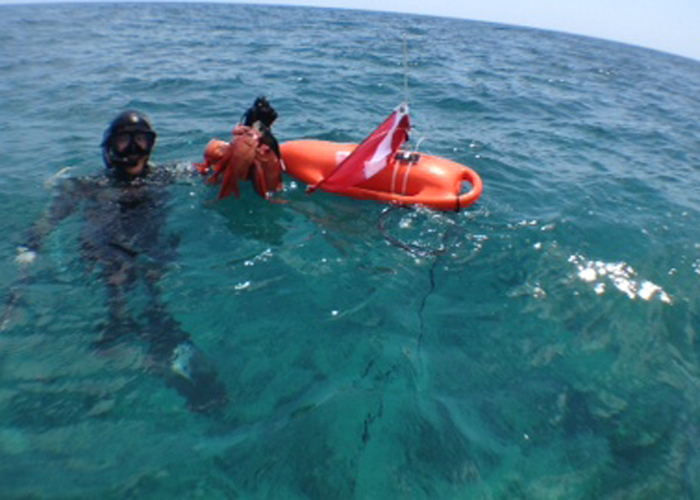 We couldn't have done with without our Red Sea Crew! Raina did a great job MC'ing the event. 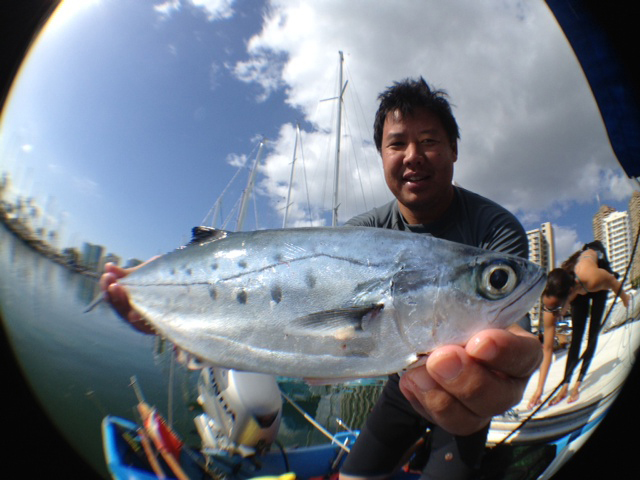 Garret an Tsutomu Lures had incredible heads for sale. 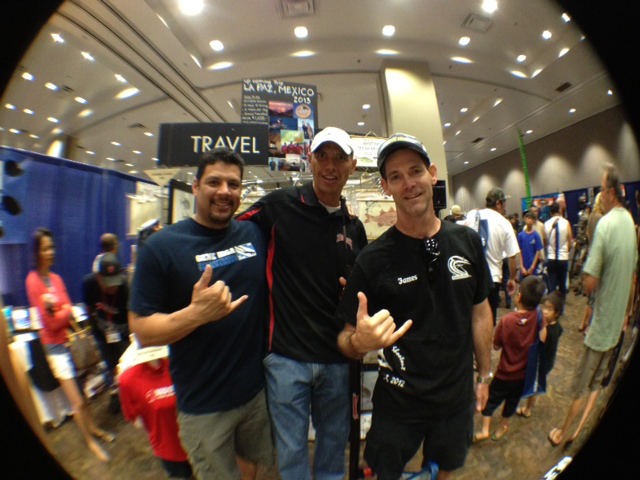 Sam Gutierez, Robert Umiamaka, and James Pierce also hung out at our booth. Thanks for coming by everyone and we really appreciate all your support! Now I'm ready for a vacation! A light flaky layered dessert stuffed with custard and drizzled with chocolate and powered sugar. Broke da mouth! 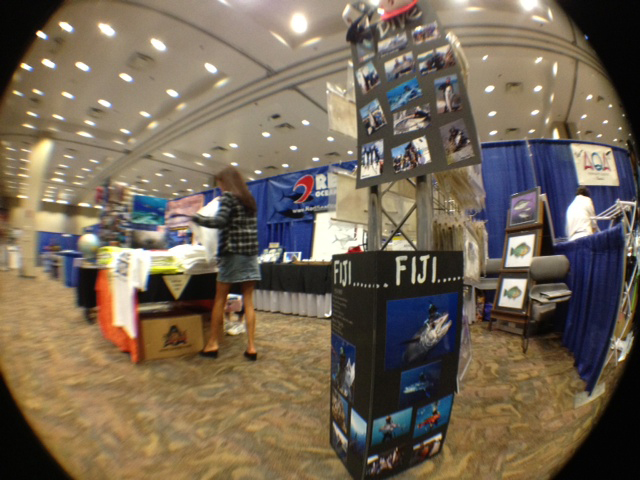 Getting ready for the Hawaii Fish and Dive Expo! Come check us out at booth 214 and 216! This Sunday from 9-6 pm. See ya there! Hot off the press! 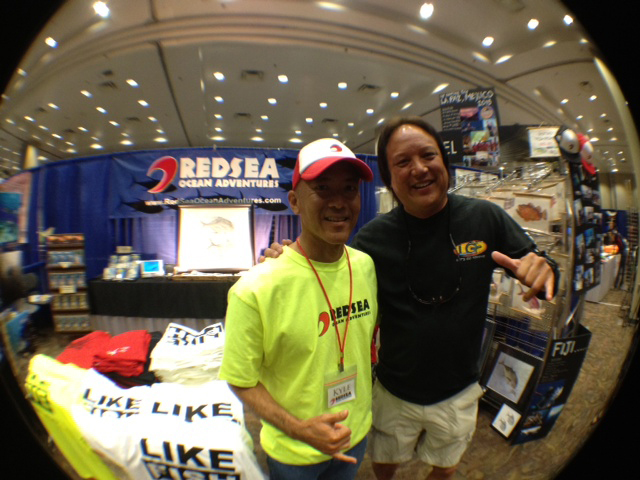 For you Facebook Fans who "Like" to fish or dive! 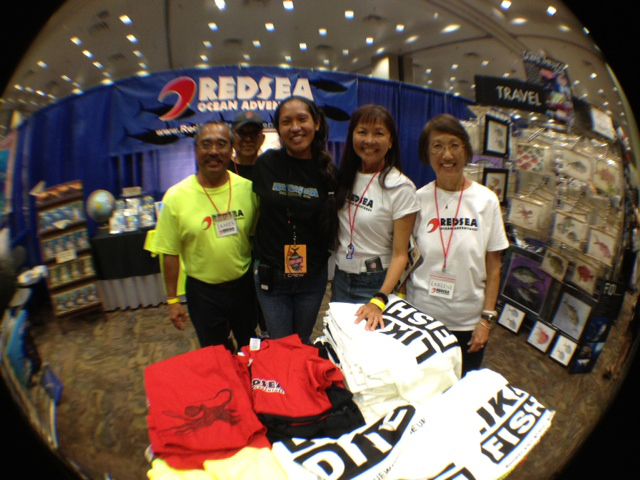 Come see us at the HSD Fish & Dive Expo this Sunday, March 10 at the Neil Blaisdell from 9-6 pm. See you there! We got to see some amazing things on this Fiji trip! 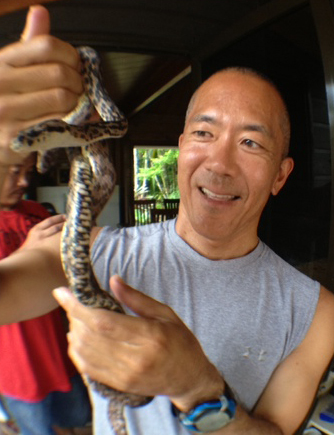 I even got to hold two pet boa constricters snakes and the boys saw sea snakes in the water while diving. HSD Diver Owen Adams Sr. showing us how it's done taking down this nice mu! 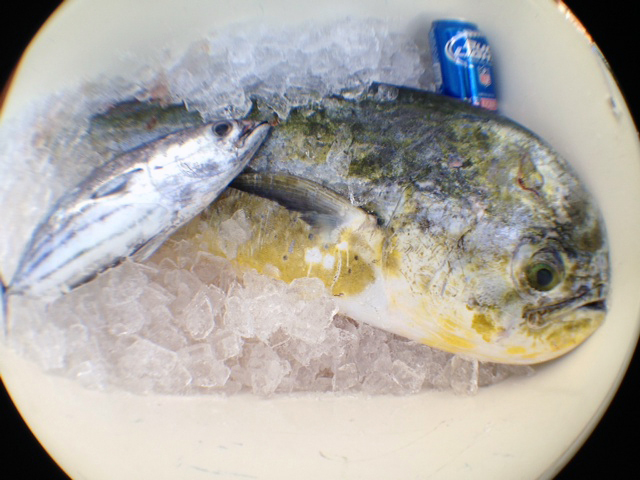 Coronations and blue trouts were no match for these boys. We ended up steaming them in our secret sauce and they were so ono! 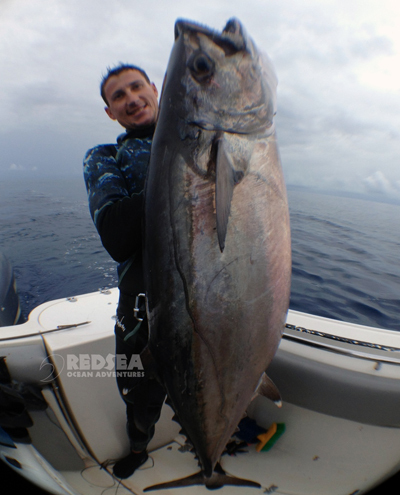 HSD Diver Keaka Ching also blasted this big Awa one day. I seen him in the water with this fish splashing all over so I jumped in and took a few shots. And another view of the "Beast"! Good Job Jaga! 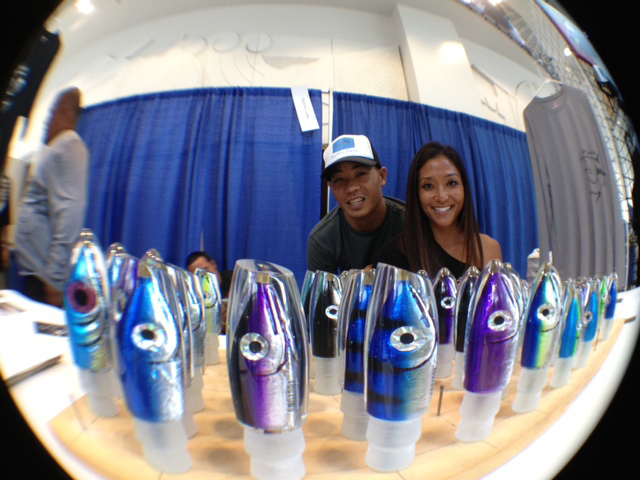 Now its time to get ready for the HSD Fish and Dive Expo this weekend! 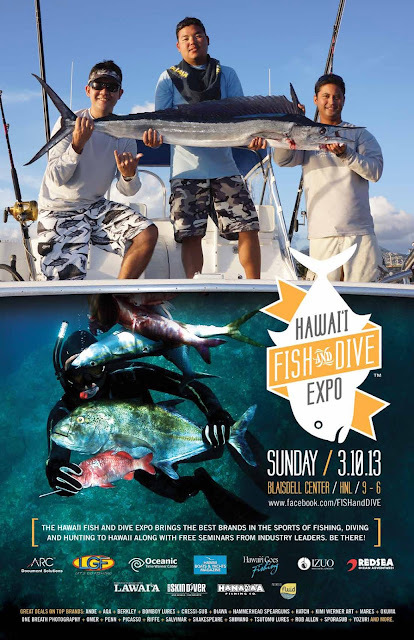 Come check our booth out this Sunday March 10 from 9-4 pm at the blaisdell. See you all there!